Farm Credit of the Virginias, a customer-owned financial cooperative, announced Monday that they are paying just over $21 million in cash to their customers in the form of a patronage dividend. The patronage dividend program helps reduce our customers’ effective cost of borrowing and returns money directly to the communities we serve. As a cooperative, Farm Credit distributes a portion of their profits to their customers. Due to record earnings for 2013, the Board of Directors declared that in addition to the regular patronage dividend, which typically represents 12 percent of the amount of interest paid on loans in a given year, a second “special” patronage dividend would also be paid totaling another 12 percent, bringing the total patronage dividend to just over $21 million. The regular patronage dividend will be paid in cash on April 4, 2014. The “special” patronage dividend will be paid in cash on June 2, 2014. “We are proud to be one of the few financial institutions that directly rewards our customer-owners for their loyalty and thank them for the business in a very tangible way. The patronage dividend program also helps reduce our customers’ effective cost of borrowing and returns money directly to the communities we serve. Our Board of Directors understand the critical role Farm Credit plays in sustaining our agricultural industry and our rural communities,” remarked Dave Lawrence, CEO of Farm Credit of the Virginias. 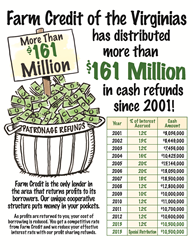 Since 2001, Farm Credit of the Virginias has paid over $161 million in patronage dividends to its customer-owners. Farm Credit of the Virginias provides over $1.5 billion dollars in financing to more than 10,000 farmers, agribusinesses and rural homeowners throughout Virginia, West Virginia and western Maryland. Farm Credit is a cooperative capitalized largely through investments made by farmers, ranchers and the rural homeowners and agribusinesses that borrow from them. Farm Credit helps maintain and improve the quality of life in rural America and on the farm through its constant commitment to competitive lending and expert financial services. For more information, visit http://www.farmcreditofvirginias.com.